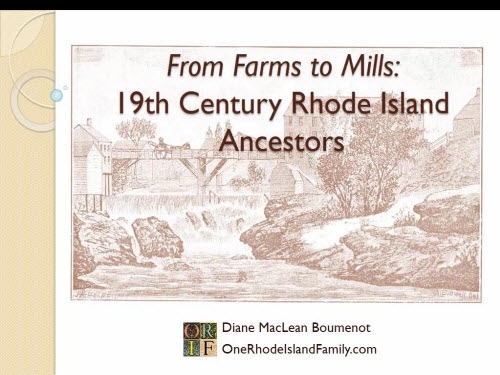 Descendants of John MacAndrews, who was present in Quidnesset, Rhode Island in the late 1600’s, owe a great deal to their early 20th-century genealogist, Miss Harriet Frances James. Miss James’ story is told by Lora S. LaMance in her book The Greene Family and its Branches (Floral Park, NY: Mayflower Publishing Co., 1904(?)). From the words, one gets the impression they may have been friends. (p. 103) Chapter XVIII, Line of Lieut. John Greene of Coventry – Descendants of Hannah Greene-Andrews. This chapter is a difficult one. In the main I follow Miss Hattie James’ work, “The Andrews Genealogy.” This lady inherited an aptitude for genealogical work from both her father and grandmother. She was born in an Andrews community, and personally knew the half dozen old gentlemen of 85 and 90, who were looked up to as authority on the intricate family relationship. She interviewed all of these, solicited family records from branch after branch, and made a careful study of the old books and records. After years of labor and expense, just as she was getting it into shape for publication, grievous bodily affliction befell her. She finished it lying upon her back, and writing with benumbed, half-paralyzed hands. The Gleaner of Phenix, R. I., ran it as a serial for something over a year. A friend tells us that this invaluable work has netted its author not a penny. When her years of suffering are over, too late it will be realized by this family that a historian was in their midst, and they appreciated her not. Hattie James never married (according to her census records) and apparently ill health prevented her from completing her work in book form. Her father had a career in mill operations which took the family from Coventry (the village of Washington) up to Pawtucket, Rhode Island. According to her own genealogical writing (p.145), Hattie James (4 Nov 1846 – 19 Mar 1916 – death date taken from Pawtucket, R.I. City Directory, 1916) has the following place in the Andrews family: Harriet Frances James(8) Albert Greene James(7) Jane Andrews(6) Timothy(5) Elnathan(4) John(3) William(2) John(1). Miss James’ work exists today in two versions. A set of scrapbooks at the Rhode Island Historical Society contains the newspaper clippings for Harriet’s work in the Gleaner as well as other news items, obituaries from circa 1900, notes and ephemera. I have examined this and the notes, etc are mostly unrelated to the early Andrews. I have no photographs or specific notes about this manuscript. A three-volume compiled version of her work, with additions, notes and corrections by Anthony Tarbox Briggs is available from the Family History Library on microfilm #22323 Item 1. 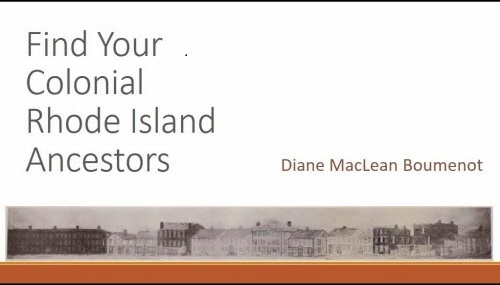 It is also available at the Rhode Island Historical Society. Maple Root Baptist Church, a very significant church for the Andrews who spread west to Coventry, Rhode Island. From The Greene Family and Its Branches by Lora S. LaMance, 1904, p. 106. January 1, 1672, he and five others, Capt. John Fones, John Greene, (Quidnesset John) John Briggs, Henry Tibbetts and Thomas Waterman, bought a large tract of land in Narragansett Country for a valuable sum, of Awashuwett, Chief Sachem of the Narragansett Tribe of Indians, the tract since known as the “Fones Purchase”. The above men were all residents of Quidnesset except John Fones who lived three miles west, now “Briggs Corner”. Although that situation (that is, the 1671 beginning of the Andrews family story) hasn’t changed too much in the years since, I feel that more work could and should be done to piece together the early generations of Andrews. First – He came originally from Scotland. The original name, MacAndrews, helps to sustain this and it has come down to the present time in some of the families of his descendants. 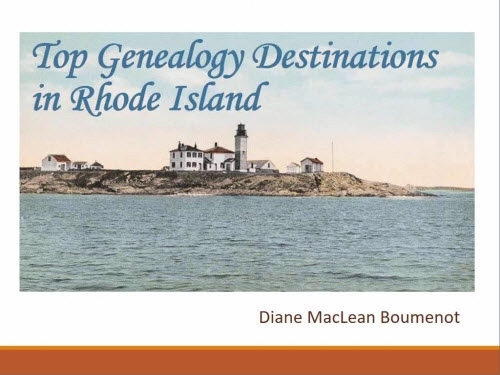 Second – There were three brothers, so there were in the Alfred Andrew’s Genealogical Record, but I am not able to connect our Rhode Island Andrews with them. Third – He was driven out of Boston on account of the liberty he took in expressing his opinion, probably on religious views. His obstinacy in sustaining his rights seemed like John of Boston after he came to King’s Town. Fourth – He came to King’s Town from Cape Cod. This too is an old family tradition. Fifth – Sometime since leaving Scotland he had lived in Barbadoes, but not so well sustained. I admire how she presented these as unsubstantiated rumors, which is certainly the truth. In her genealogical pages, she unfortunately incorporates them into her narrative, but resists glorifying or exaggerating these stories in any way, which many of her contemporaries would surely have done. [page 9] Land around “Devil’s Foot Rock” for quite a distance took its name from that ledge. This legendary rock is near the Post Road about halfway between Greenwich and Wickford. It is being broken up now and carried off to be used for some purpose which I do not remember. It is a grey granite, also a natural curiosity which it seems a pity to disturb. It is termed “Devil’s Foot” from impressions made in the rock that resemble the marks of a human foot made in the snow. [page 13] John Andrews (2) … deeded for love, etc. to his six brothers a share of their father’s property. “To my six brother, William, Charles, James, Thomas, Edward and Benoni, all interest I have by my father, John Andrews deceased, unto 70 acres, which is part of 90 acres in Greenwich. And if any brother die before he is twenty one, his part to go equally to the others. The full improvements and benefits of 70 acres to be at the disposal of mother-in-law (i.e., step-mother) that now is Mary Andrews, until the youngest brother is twenty one”. The Remains of Frenchtown, from Memoir Concerning the French Settlement, 1879, p. 1. He agrees to pay for life to his step-mother 10 bushels of apples yearly. He sold Captain Thomas Fry of East Greenwich his interest in a certain tract of land in Narragansett Country near Devil’s Foot, bounded partly by land of his father, John Andrews deceased, who had with others bought land in 1672 of certain Indians. John Jr. was one of the 24 partners to the “Fones Purchase” when it was confirmed in 1677. When he sold the above mentioned land top Thomas Fry April 1, 1698, he lived in Newport. His stay in Newport was short. In 1700 he lived in East Greenwich and his children’s birth were recorded here. He died before 1721. Rebecca, his widow, married (2) June 18, 1721, John Nichols of East Greenwich. His land heired from his father, joined his own at “Devil’s Foot” and run up to his father’s homestead and west towards Frenchtown. It seems clear that she examined deeds in either East Greenwich, North Kingstown, or both. The above paragraphs are her interpretation of those deeds – others might reach slightly different conclusions. I do plan to look at them myself. I would like to revisit the East Greenwich and North Kingstown records mentioned here and make my own analysis of the early deeds. Photo from East Greenwich Town Hall by Diane Boumenot. Miss James presents the following genealogy for John (1) Andrews. See my links toward the bottom of this post for some additional pages. JOHN MACANDREWS, alias ANDREW, first of King’s Town, came from Scotland and lived in Boston, at Cape Cod, and is known to have lived in King’s Towne before May 20, 1671. He died there before August 22, 1693, for at that date his eldest son, John, settled his father’s estate. He married first _____. They had 2 children, John and William. He married (2) Mary Ridgely by whom they had 5 children, Charles, James, Thomas, Edward, (also called Edmund) and Benoni. In course of time his descendants called themselves “Andrews”. 3 – William (2) born Aug 23, 1679, died 1762. 5 – James (2) born ——-, died 1715. 6 – Thomas (2) born ——-, died ——- No further record. 7 – Edward (2) born ——-, died ——- No further record. 8 – Benoni (2) born ——–, died ——. A North Kingstown probate record for a different family. Due to damage from an explosion, the records are challenging to use, although a great deal of effort has been put into restoration. Photo by Diane Boumenot. For a quality article on some questions about the early Andrews and Sweet families, see The American Genealogist, January, 1976, vol. 52, p 18-20: “Mary Andrew, Wife Of Henry Sweet” by Harriet Woodbury Hodge. The article cites specific deeds and the information that she gleaned from them, to place Mary Andrew as a daughter of John (1) Andrews and his unknown first wife. TAG articles are available online to NEHGS members, or at libraries with genealogical collections. A Genforum discussion by Duane Boggs titled “Griffin, Fry, Spencer and Andrews“ takes some of these same deeds (above) and speculates that the first wife of John (1) Andrews was a heretofore unknown daughter of Robert Griffin. A more complete version of the Atherton and Fones deeds can be found in The Records of the Proprietors of the Narragansett : Otherwise Called the Fones record (1894) by James N. Arnold. John Andrews is found on page 166, 167 and 168. Austin’s Genealogical Dictionary of Rhode Island, page 3 of the 1969 or 1978 edition published by Genealogical Publishing Co. It can be viewed in an older edition here, although the reproduction is of poor quality. Torrey’s New England Marriages Prior to 1700 cites Austin and seems to have no further evidence, although with so many John Andrews entries, there’s always a possibility. Some court records for John Andrews, showing that he and Mary Ridgely were fined after the birth of their child (as well as his appearance in some other capacities) are briefly chronicled here and there in the book Rhode Island General Court of Trials, transcribed by Jane Fletcher Fiske, 1998. There are some Andrews in Gleanings of Newport Court Files, 1659-1783 by Jane Fletcher Fiske, 1998, however these appear to be too far into the 1700’s to be among the first couple of generations of Andrews. These two books can be found at libraries with Rhode Island genealogical collections. I think Miss James’ work is good, although far better on the lines that eventually spread out to Coventry, where she came from, and the Maple Root Church, than on, say, my lines, which appear to be barely known by that group. But in many ways, her work was just the beginning of the early Andrews story, missing some portions and in need of additional evidence and clarification. I have copies of pages 1 – 150 of the Andrews Genealogy book (covering approx 1690-1825) – download pdf copy of that here – which gets through the first few generations. I also have a copy of the entire index, about 100 pages – a pdf of that will download here – if, after using the index, you need more than the pages I have available here, you will have to rent Family History Library microfilm #22323. Personally, I am descended from sons Charles (2) and Benoni (2). More on that another time. I have a lot to do to follow up on these sources. Grave of Harriet F James and her parents, Albert C and Mary A James, at Woodland Cemetery, Coventry, R.I.. Photo used with permission from FindAGrave.com contributor “Harriet”, from entry #65156414. Hi Diane and thanks for the nudge back here. My guess is I need to go back to Foster for my Rachel Andrews connection; that is where the census states she was from. More research is needed on Andrews in Foster, to see if I can find more about the “family” there and if her father owned property, where/how did he acquire it. on March 11, 2015 at 7:30 am | Reply Cynthia F.
Diane, Lois and I both have an Andrews (b 1646?) in our tree who is something of a mystery man. He married Rachel (Towne? ?, b 1654??). They had a daughter, Judith (b 1674). At some point Andrews disappeared and Rachel married Clement Weaver. Judith adopted her stepfather’s name. Judith married Henry Matteson Jr. They had a son James Matteson. I descend from him thru both his wives, Enfield Greene and Hannah Sweet. Have you bumped into my Mr. Andrews in your search? Thanks for the note Cynthia. I have heard this story, and I think there is a lot of uncertainty. To me what it really comes down to is a lack of knowledge of this family before, say, 1680. We really don’t know their origins (other than some mythology) and we really don’t know how many there were at the beginning. I think we can all say no really good work has been done on John Mac Andrew’s origins. One would need to, perhaps, dig up some new evidence and carefully analyze what is known. If you ever unearth anything new I would love to know. Thanks so much! I’m having trouble finding my 6th great grandparents, Rachel ANDREWS (~1679 – 1740, RI) who married Jonathon NICHOLS (1681 Kent, RI – ~1740). I find Jonathon Nichols listed in the Index for pages 139 and 147, but when going to those pages in the accompanying pdf, I don’t see him listed. The John Nichols that is listed on page 13 is not the right one. Thanks for any assistance! Beth, what are your sources for believing that those are your ancestors? As you can see from the book, a woman born this early would have to be a child of John (1) Andrews and his first wife if she were a part of this group (and not a part of some other Andrews family). Anything is possible, of course, because I don’t think the Andrews researchers have documented the female descendants very well. You will want to really know what evidence you have for them. Couples from this era are hard to document, and so you need to be careful about accepting the work of others; they can SO easily make assumptions and get things wrong. Thanks, Diane for responding. You’re ‘preaching to the choir’ about primary sources 😉 And, thanks to your comment, and my searching my files for Rachel Andrews, w/o John Nichols I realize that I don’t have any record of why I thought this to be accurate! Yikes! So, thank you for helping me clear this up. Well without vital records, these wives can be hard to pin down, but examining the husband’s deeds (if they exist) might help you, and of course looking for patterns in how they named the children. If you pursue this and you DO get led back to the name Andrews, leave us a note here. I suspect several early women have been left out of the book. Yes, deeds and wills are great primary sources and the naming patterns have really helped with other family lines. I’ll be sure to let you know if I do eventually find a documented Andrews connection! thank you for all that you do and wish you continued success! Thank you. Should have looked further in my email list.